Terraset Elementary School - Rinker Design Associates, P.C. The Terraset Elementary School Expansion project (Fairfax County site plan #6250-SP-01) was prepared in coordination with a local architect and Fairfax County Public Schools (FCPS). 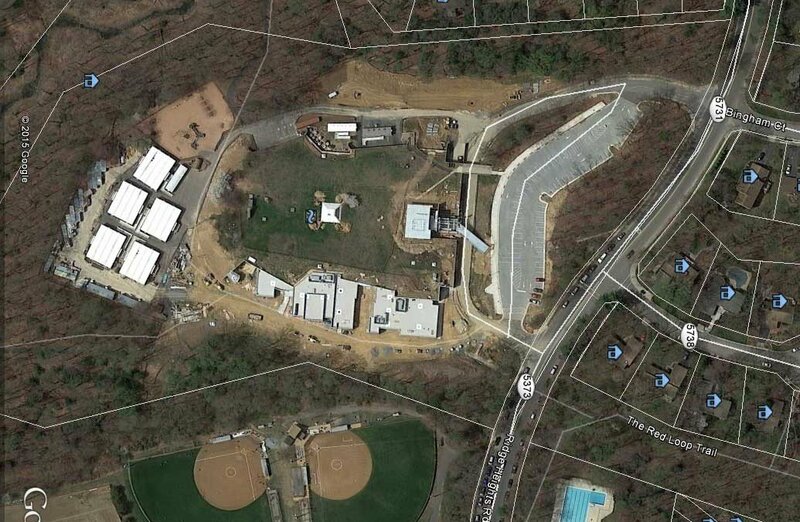 The school is located on a 14.4352-acre parcel in Fairfax County at 11411 Ridge Heights Road, in Reston. Terraset Elementary School was originally constructed in 1977. The first step of the process for the expansion of this school was to gain approval of the Planned Residential Community Application (PRC C-203) from the Farifax County Board of Supervisors. This application required extensive coordination with the Reston Association Design Review Board and the Reston Planning and Zoning Committee. The design of the current project began in 2012. A total of 33,463 square feet of floor area was added to the existing 68,880-square foot building. The site design included utility layout, site grading, and a parking lot expansion layout. The requirements of the PRC Plan as well as landscaping and zoning requirements also had to be met. BMP/Storm Water Management utilizing Low Impact Designs were designed for this site and coordinated with the Fairfax County Stormwater Planning Division. The design utilized a large section of pervious pavers in the upper parking lot, pervious asphalt for the basketball courts , multiple filterra units and over 200 linear feet of twin 72” detention pipes. In addition, RDA prepared a Resource Protection Area (RPA) Delineation for the area adjacent to Snakeden Branch to confirm the location of the RPA for Fairfax County (6520-RPA-001). One of the major challenges of this project involved merging the proposed addition with the existing facility on a very “tight” site. RDA was able to meet the school’s site needs while addressing environmental and zoning requirements in addition to the concerns of the Reston Association. Construction for this project began in 2014 and since the school was to remain in operation throughout the duration of construction extensive coordination administration services were required. These services included the answering of requests for information and the review of potential change orders.